What to my wondering eyes should appear but The Codex Judas Papers! It arrived this morning in my mailbox, all 650 pages of it, and remarkably published in the year after the Codex Judas Congress had convened here at Rice University (March 13-16, 2008). April DeConick (ed.). 2009. 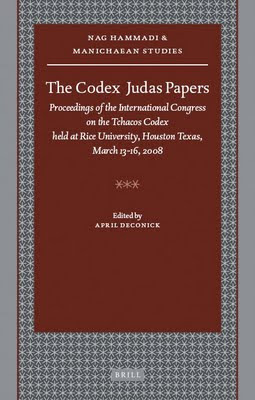 The Codex Judas Papers: Proceedings of the International Congress on the Tchacos Codex held at Rice University, Houston, Texas, March 13-16, 2008. Nag Hammadi and Manichaean Studies 71. Leiden: Brill. It is an expensive volume so you might need to check it out of your library. See my earlier post about the book for ordering information. The papers in it are of the highest quality, and the volume represents a landmark in Gnostic studies and our understanding of the Gospel of Judas. Scholars address issues of identity and community, portraits of Judas, astrological lore, salvation and praxis, text and intertext, and manuscript matters. Although the contributions show a variety of interpretations of the Tchacos texts, several points of agreement emerge, including the assessment that the Codex belonged to early Christians affiliated with classic Gnostic or Sethian traditions who were in conflict with other Christians belonging to the apostolic or conventional church.